Product prices and availability are accurate as of 2019-04-03 15:00:47 EDT and are subject to change. Any price and availability information displayed on http://www.amazon.com/ at the time of purchase will apply to the purchase of this product. Yumi Bio Shop Exclusive Product - A free Sample of one of our products with every shipment! 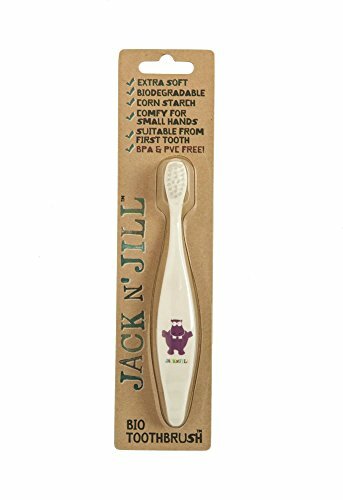 The cute and functional toothbrush for kids by Jack N Jill is an innovative product: The handle is made from pure and GMO-free maize starch and the brush head is composed of recycled DuPont nylon bristles. Thus the toothbrush combines eco-friendliness with a child-friendly design. Application: Jack N Jill recommends replacing the toothbrush every 8 weeks or sooner if illness occurs. Snap the toothbrush in two to dispose of the handle in organic waste. The handle takes approximately 90 days to decompose. The brush head can be disposed of in residual waste.